Throughout a period of rising political tensions both at home and abroad, Norah is present at key debates in the Commons and her diaries give a sense of the excitement of the times. She assists at a number of local elections and at a by-election in North Hammersmith, noting the Conservative losses in her diary with some anxiety. At home, her husband’s health is worsening but her impressive and hectic schedule continues until the general election in 1935. By the end of that year Norah has lost her Parliamentary seat and her much loved husband died soon afterwards. It was, as she writes on 31 December, “a ghastly year” for her. 22 February 1933 Norah meets Captain Colman of the Port of London Authority to investigate ways and means of dealing with a slum clearance scheme at Lavender Dock in Rotherhithe. 2 March 1933 Norah attends the Dog Racing standing committee at 11 and goes to an “At home” with the Prime Minister’s wife, Mrs Baldwin. 9 May 1933 Norah visits Plymouth, Lady Astor’s constituency. She is met off the train by a naval officer and “addressed the annual meeting of the Alexandra Homes for Lady Astor who was there”. Alexandra Homes had been founded by Lady Astor as a Plymouth version of Peabody Trust homes, in 1924. Norah later tours the housing estates and dines with Nancy Astor before returning to Paddington at midnight. 28 June 1933 Norah goes to Central Council Meeting at the Friends House in Euston. She described it as exciting; the topic of debate was Conservative policy on India. “Mr Baldwin spoke, Churchill, Lord Carson, Lord Lloyd all spoke.” After lunching at Euston station, she returns for the division. The vote was in favour of Government policy 838 and 356 against. Churchill was not in favour of Government policy of limited independence for India. 6 October 1933 Norah attends the Conservative Party conference. There was “excitement over India but White Paper supporters had big majority when ballot was taken. Neville Chamberlain made a splendid speech”. 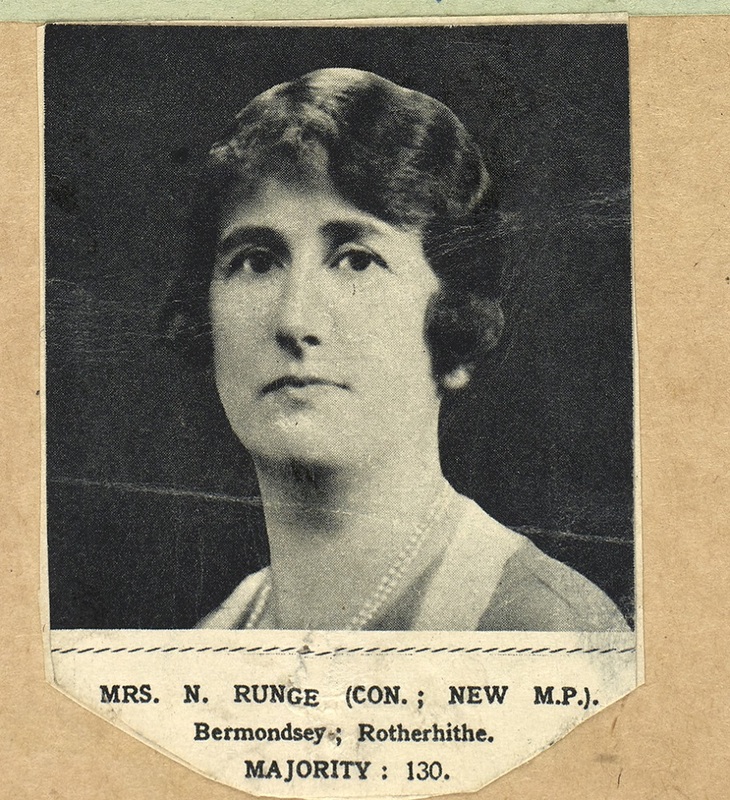 6 December 1933 Norah notes despondently that the Conservatives lost another council by-election in Rotherhithe on this day, clearly worrying about the implications for her parliamentary seat. 20 February 1934 Norah is busy in the House with the Unemployment Bill. Her amendment was due to be called but it was not reached. 11 April 1934 Norah visits North Hammersmith to see how polling was going in the by election caused by death of Conservative MP Mary Pickford. Labour won. 16 April 1934 Norah attends the debate when Winston Churchill accuses Sir Samuel Hoare and Lord Derby of bringing pressure to bear to alter evidence given before India Joint Select Committee. “Sensational afternoon.” She then attends the London Unionist Members’ dinner at the Commons, including Baldwin and Sir Samuel Hoare. 24 April 1934 Norah goes to the North Hammersmith by election. The result is broadcast at midnight: “Socialist got in majority 3,600.”This was the fifth by election lost in a row by the Conservatives in the National Government. 14 June 1934 In the House, Norah notes that the behaviour of British Fascists was under discussion. 30 June 1934 Norah’s son is due to go to Germany, but as she relates, “helped John get things ready for going to Germany on Monday and then heard in evening of awful happenings in Berlin and Munich, a revolt against Hitler.” [Revolt by Ernst Rohm, known as Night of the Long Knives] John did not go. 17 July 1934 Norah is preoccupied with the committee stage of the Betting Bill. 12 September 1934 Norah’s diary had begun to report that her husband is ill; on this day he has an emergency operation and is in a nursing home until the end of November. Norah is increasingly preoccupied with crises at home but still manages to speak in the House. 12 November 1934 Norah speaks on an amendment to the Betting Lotteries Bill in the Commons, which didn’t rise until after 5am. 20 November 1934 State Opening of Parliament: “very foggy, no Royal procession, they came in motors”. 29 November 1934 Norah listens on wireless to Royal Wedding (Prince George and Princess Marina). She had two seats in Parliamentary Stand in Parliament Square but didn’t go in view of her husband’s illness. In January and February Norah is increasingly preoccupied with domestic problems, particularly her husband’s health. She writes less and less about political matters in her diary although she records attending the Commons to participate in votes on a three line whip. 12 March 1935 Norwood by-election won by official Conservative candidate. Norah’s daughter Peg had participated in the Conservative campaign. 3 April 1935 Norah lunches with Mr and Mrs Neville Chamberlain, she is the only woman guest so sits next to the Chancellor. 12 April 1935 Norah is involved in a meeting at Bermondsey Town Hall with her election agent Fisher to see the Mayor to hear his explanation of why he will not meet the King on occasion of South London Jubilee drive. 15 April 1935 Takes her seat at 7.15 am in the Commons chamber for Chamberlain’s fourth Budget speech. 6 May 1935 Attends Jubilee Day at St Paul’s, she was taken by Lady MacPherson (mother of her son’s fiancée Fiona). 9 May 1935 Goes to see the King and Queen receive Loyal Addresses from both Houses of Parliament in Westminster Hall, “wonderful ceremony”. 15 May 1935 Norah speaks briefly on India Bill Women’s Franchise amendments. 27 May 1935 To the Ministry of Labour with other women MPs, deputation to Minister. 28 May 1935 Attends Queen’s Hall Women’s Conference. 3 June 1935 Meets Ethel Tawse Jollie, a writer and political activist in Southern Rhodesia who was the first female parliamentarian in the British overseas empire. She was observing the Commons from Gallery. 5 June 1935 Three Line Whip India Bill 3rd Reading. She dines in the House of Commons with Sir Ian and Mrs Tawse Jollie. 4 October 1935 Visits Bournemouth for Conservative Party Conference. 11 October 1935 Norah begins her election planning. 23 October 1935 Norah is in the House to hear Baldwin announce the dissolution of Parliament and attends the prorogation ceremony on 25 October. 28 October 1935 Begins her election campaign for the 1935 general election. 14 November 1935 Polling day. Norah is beaten by the Labour candidate by 4,665 votes. She makes no comment on her defeat in her diary but the entries are only brief for some time afterwards. 8 December 1935 Her husband dies in his sleep. 31 December 1935 Notes in her diary “end of a ghastly year”. Very interesting! Do all of these dates come from excerpts of Nora’s diary?